I do love the crochet gleefull garland and I think I will try this myself. Thank you for the lovely idea. that is a beautiful christmassy garland - thank you! wow! what a lovely gleeful garland! Great idea !! 'bout the sweater thing. I can't recall my x-husband possessing one of these awful x-mas jumpers ,and I can only imagine the looks on his face if he had! and if I had boiled it and cut it into a sweet little garland to look upon during the x-mas season,I think he might have been just a tiny bit annoyed.Haha! but I might do my best to dig out an alredy ruined wooly jumper.I'm sure I've hid a couple in the cellor, not being able to through them away...Great and easy idea! Thanks! Very sweet! 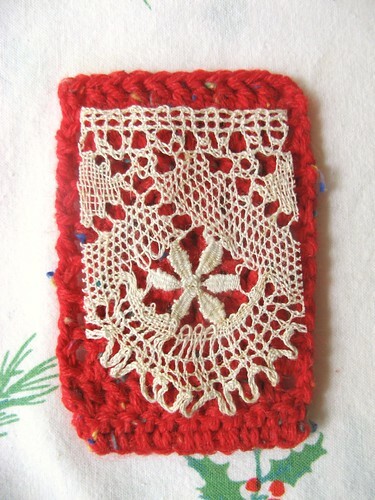 I like it lots, especially with the pretty lace bits. You have such a huge imagination with craft bits and they all turn out perfectly. Those rectangles are all so flat and even! Mine would not look nearly as nice I fear. So simple, so wonderful ! ! ! How can something so simple pack such a wallop ? 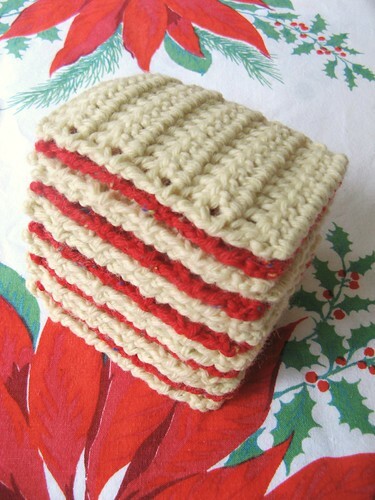 Never before have I wanted to go out & scoure the oppies (or thrift shops... as you say....) for a hideously festive Christmas jumper (or sweater, as you say....), but being sorely lacking in the crocheting and or knitting department, that is exactly what I now have the urge to do. feeling a little experiment coming on.. 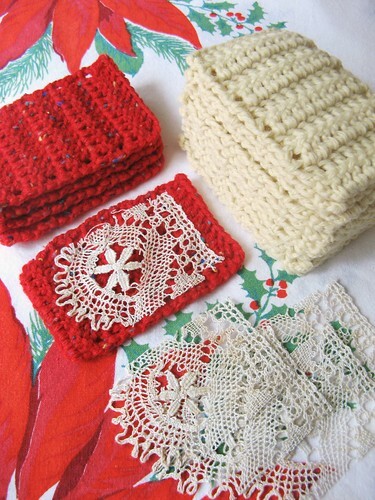 The speckly red looks so much more gleeful in your garlands than in my stash! I'm so pleased that they are behaving and loving their new digs! A new lease on life for them, and oh-so-gleeful! So inspiring. You have me wanting to make a garland for our house! Such a cute garland. I love it! 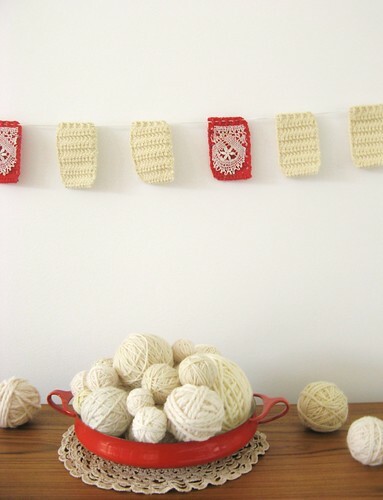 I have been thinking about thase dreamy cream colored yarn in that red pot (Dansk?) all day. I think I love them. It was a wonderful and easy way to jazz things up a bit now in this dark season. Thank you for this idea. I think I'll try to find some yarn and laces that fit, and make me such. I wish you a very good and creative day. i especially admire that a moment is never wasted and that even waiting during chauffeuring duties your mind and hands dont rest! 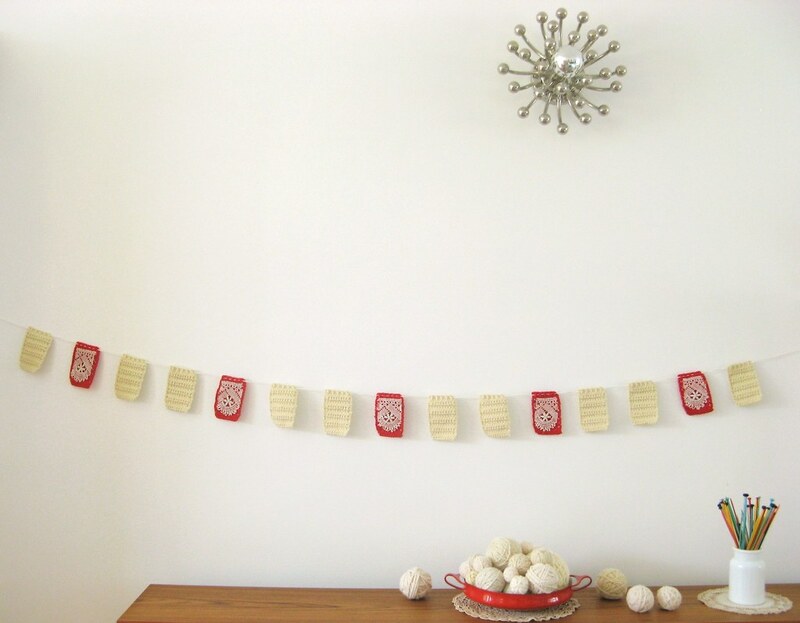 The French would go crazy for your garland this year, Tif - simple red and white is what it's all about this Christmas. It's absolutely lovely. Can't begin to tell you how much I need some "glee" this week-whether it's Holiday Glee or just any garden-variety type of glee...have been in an awful funk for days and this was quite a little shot of happy!! The Garland is charming and I may even cobble one together from my own scraps and remnants! oh, i hope i NEVER tire of the word glee! 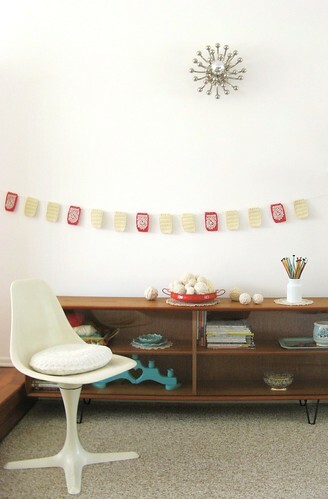 a perfectly subtle garland and, yes, easy peasy. thank you for not "speaking down" to the masses and finding such a sweet way to encourage even the clumsiest of crafters! this would be nice with some vintage cards or crafting papers too.... maybe stitching onto them with a machine or sewing on lace! oh, i think you're onto something with all these garlands. there is, perhaps, nothing more gleeful than a garland. Gleeful indeed! I felt the same way about my Natural Treasures garland, for there was no glee after I removed the very "gleeful" witches garland! i'm loving all the gleefulness. That garland is just divine. It is exquisitely simple and beautiful and I want one! wow, what cool idea :) I totally agree with you that the beauty of simplicity often is the best! puh, well, now I'll get myself some yarn start and get going. I simply need one of these garlands :) thank you for inspiring me!